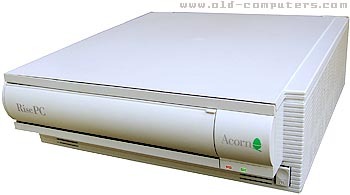 In April 1994, Acorn announced the release of the second generation of ARM machines � the Acorn RISC PC 600. Code named the Medusa project, this was set to replace the then ailing flagship A5000 machine. As the name suggests, one of the main features of this computer was that it could run both Acorn and IBM-PC software side by side. This was achieved by a second CPU slot that could accept a daughter board with a PC CPU, such as a 486 or 586. This second processor then had shared access with the primary CPU to all the system resources. No more CPU intensive software PC emulation required! As well as the second processor, other major enhancements included an updated video controller with the option for dedicated video RAM. The graphics chip in previous Archimedes range machines had shared the system memory with the rest of the computer which often proved to be a bottle neck without true DMA. Now the video controller could have video memory of it�s own, removing the bottle neck. The system data bus was doubled in size to 32bits wide, and the MEMU and IOC chips were combined to create the IOMD20. This resulted in much better overall I/O, yet another bottle neck removed from previous machines. The system memory was also upgraded to a maximum of 256MB and the memory bus was designed to use the more widely available EDO SIMM�s. A unique feature of the RISC PC was its case. This came in the form of the base holding the motherboard and power supply, a mid section for mounting one 3.5" device, one 5.25" device and two single width expansion cards, and then a lid. The magic was that you could add up to 8 slices at any time, giving you a very easily expandable computer, and all held together with clips and springs negating the need for a screwdriver. Very neat. There were 2 other Acorn RISC PC's. The RISC PC 700 was released July 1995 and the RISC PC-2 was much publicised by Acorn and then dramatically cancelled at the last minute. Thanks to Paul Hadfield for his kind help. see more Acorn Computer Risc PC Ebay auctions !